Are Slow Cooker Liners Really Worth It? A lot of people swear by slow cooker liners so I decided to test them out myself. If you’re new to slow cooker liners too, let me explain exactly what they are and if I think they’re worth it. What are slow cooker liners? They’re plastic bags that you put into your slow cooker (AKA crockpot) before adding the food. One liner is used per meal and thrown away after the meal is eaten. Why would I use slow cooker liners? The biggest benefit is that they line your slow cooker so there is no mess left to clean up. When you’re done eating, you simply remove the bag and throw it away. There will be some moisture left in the slow cooker, but all you need to do is wipe it out – no soaking or scrubbing necessary! Who should use slow cooker liners? There are many different brands of slow cooker liners, so I would read the box carefully before buying or research the brand online. Crock-Pot brand liners are BPA-free. 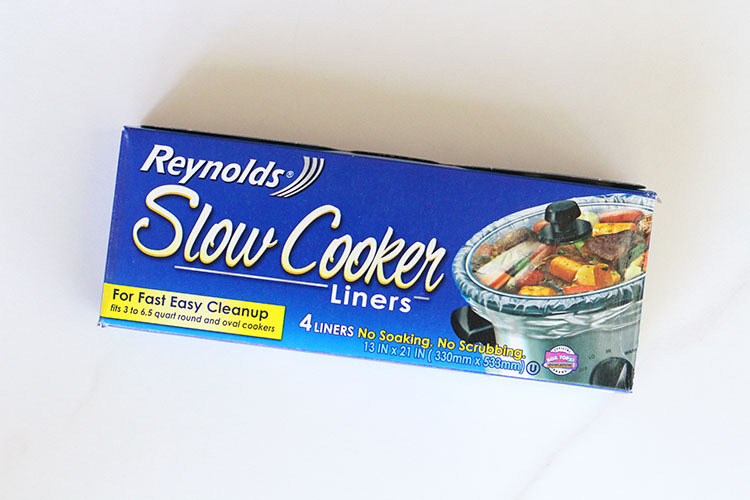 So are Reynold’s Slow Cooker Liners, which are the ones that I tested. What size slow cooker do they fit? It looks like most liners fit 3-7 quart oval and round slow cookers. My grandparents have a 2.5 quart slow cooker and I don’t think it’s too small for a liner. There will just be extra liner hanging outside the slow cooker. Can you use liners with slow cooker freezer meals? 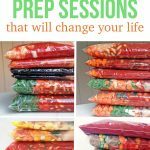 Readers have left comments on my blog saying that they assemble their slow cooker freezer meals in slow cooker liners and then place the liners in gallon-sized plastic freezer bags and place them in the freezer. 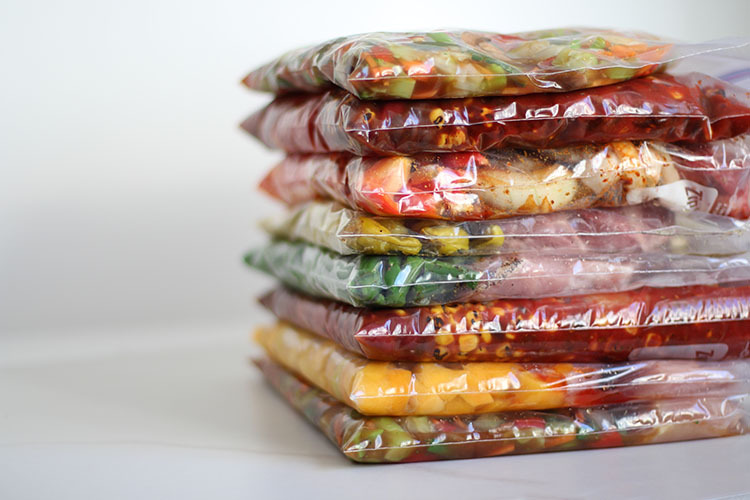 (Most people say that they reuse the outer freezer bag after cooking the meal.) Now that I’ve used the liners myself I have no idea how this is done. I stack my freezer meals to save space in the freezer and can’t figure out how to properly seal the liner so that the meal doesn’t spill out. In my case, I would freeze the meal in a regular freezer bag and then dump it into the liner the day of cooking. 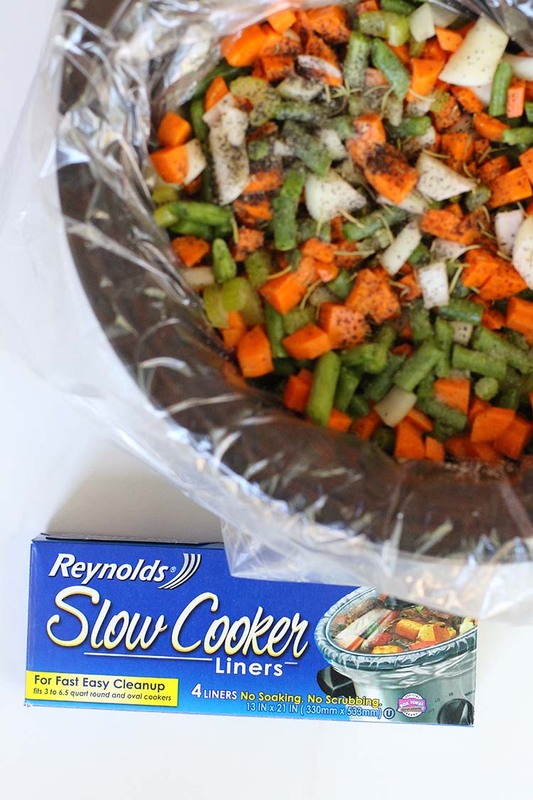 Where can you buy slow cooker liners? A quick search online shows that they’re sold in a ton of different stores. (For example, Kohl’s, Target, eBay, Amazon, and Walmart.) 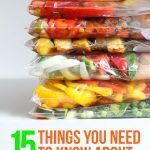 You can find slow cooker liners at most grocery stores near the foil and plastic wrap. I’ve also heard of people finding them at The Dollar Store. Are slow cooker liners really worth it??? A lot of people swear by slow cooker liners so I decided to test them out myself. My husband does the dishes after dinner so I thought he would be most excited about them. After trying a couple of them we decided that they were a cool invention but not something that we’ll use everyday. I make slow cooker meals A LOT (usually 5x a week), so the cost would add up and the idea of cooking our meals in plastic everyday wasn’t appealing to us. I’ll buy them when I see a great sale or have a coupon and use them for meals that tend to stick to the pan. I’ll definitely buy them for slow cooker freezer meals that I make as gifts. 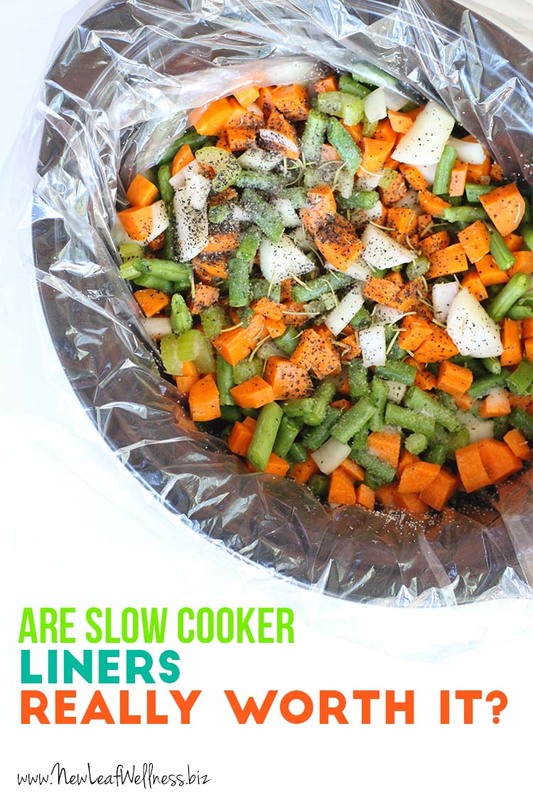 Have you ever used slow cooker liners? If you have an experience to share or a question to ask, please comment below. I’d love to hear from you. Crockpot liners have changed the way I look at using my slow cooker. My husband and sons used to HATE helping with cleanup after a slow-cooked meal. The result? I had to do the scrubbing. Now, after letting the slow cooker cool slightly, we simply pull out the “gunk” and throw it away. 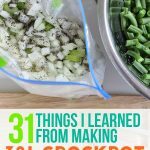 Life is happier and the Crockpot is used more frequently! You’re probably eating healthier too, Joni. Great job. I use a crockpot about once a month. I used a crockpot liner for the first time cooking a small turkey. I thought it was heavenly to lift out the bag and have no mess! I will continue to use them. My husband does not do the dishes and I’m all about the no mess aspect of these bags! Anyone else get nervous heating up things in plastic? I’m not asking to sound “judgy,” but it’s just something I’ve been thinking about recently. Even though the liners are BPA free, I’m just not fully convinced I’m not putting more chemicals into my food by heating it up with a plastic liner. I wish I WERE convinced, it would be easier for sure! But I would bet you use a microwave for your food though. Hmmmm.. I rarely use my microwave and if I do I always use glass. I agree with you. I wouldn’t use these bags. I had breast cancer 5 years ago and I just wouldn’t risk it. I would rather soak and scrub the old fashioned way! Thank you! We didn’t know DDT was a bad thing. We didn’t know running through the mosquito fog was a bad thing. What don’t we know now? Even knowing what we know now? Yes, I have also been thinking about this lately! I do enjoy the no mess clean up of the liners though. I am happy to find out that they are BPA free though! I don’t trust cooking in plastic at all. Plastic is petroleum based. I think I would rather wash my crock pot– Notice that Kelly didn’t address the safety part of your question. Exactly, and I agree! These days everyone wants the quick easy way out on everything. I personally have no interest in heating food in plastic like this. Take the time to clean the crockpot. Take the FEW minutes to clean it. What if you find out later, chemicals in products like this cause you and your family health issues. It’s not worth it. Health these days is being pushed aside for convenience. Sad. I agree. On my father’s side of the family, they used inexpensive aluminum cookware. I don’t know if there’s a connection but my many of my dads brothers and sisters are developmentally disabled. I’ve been playing it safe and replacing all my plastic Tupperware with healthier ceramic dishes. Its amazing that bpa is legal. And it’s merely one chemical that’s known to be bad. Plastics and hydrogenated food (also a form of plastic) imitate estrogen in our bodies. Whether were a male or female, do we want these chemicals with unknown effects in our bodies?! Heating food in plastic is a big concern for me, BPA-free or not. There’s a whole host of other chemicals in plastics that have not been proven to be safe. There may be no lead in crockpots, but studies have shown that the glaze used in crockpots does and that the heat allows the lead to leach from the glaze into food. The crockpot companies know this, but say that the amount of lead released is “not harmful” according to FDA guidelines. Of course, you could cook in stainless steel, but that leaches nickel. Bottom line, there is something wrong with everything. We’ve got a winner!!! I’ve seen this lead leaching bit about all clay glazing as well from over a decade ago, it’s been long know – even worse in the foreign made stuff (ALL Of it.) So don’t sweat the plastic!! I’d never use my crock pot if I had to clean the thing out after every meal, not to mention the extra storage containers I would dirty! Amy C and everyone- “BPA Free” has become a marketing slogan. It was only ever in polycarbonate plastic. So think hard, crystal clear plastic bottles. BPA was never in any other kind of food contact plastic- not Tupperware, not plastic food bags, not recyclable water bottles— nothing. Those types of plastics are either HDPE, polyethylene or PET. None of those plastics have BPA. I’ve never used one, and honestly don’t think I would. I’m cheap so the cost deters me, but more than that, the plastic! I think that some of the ‘legal’ plastics that are replacing BPA are actually WORSE for you than BPA… but because something is legal or approved by the FDA, doesn’t mean that they aren’t going to ban it in a few years! It just makes me super nervous. exactly, the FDA is now just a front for corporations. I bought some this week to use to take pots of soup to office, church and other functions. After reading all these comments I sure hope I’m not hurting my friends. I sure did enjoy the easy clean up. Crock pot pretty heavy for my arthritic hands to hold. Interesting! Thanks for sharing, Carol.